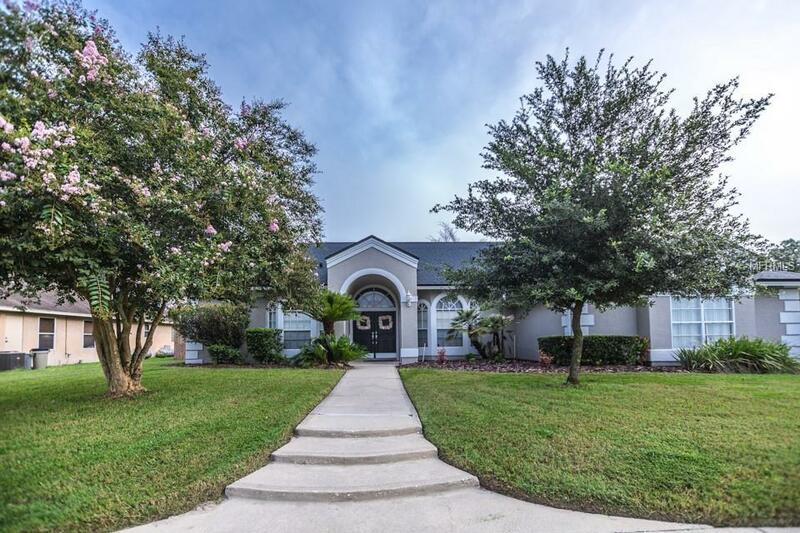 Wonderful Corner Lot, 4 Bedroom 2 bathroom Pool Home in Great Seminole County School District! Zoned for Lake Brantley High School. Open floor plan with split bedroom layout includes separate formal dining and living room areas. Over-sized master bedroom suite and master walk-in closet. Eat-in-kitchen with a family room that overlooks a custom built wood burning HGTV style fireplace. Home is nicely upgraded with tile throughout the wet areas, 42" cabinets in the kitchen, & new granite counter tops. French doors lead to the extended covered and screened lanai which is great for relaxing by the pool. This home is perfect for entertaining the whole family! Fenced back yard, recently painted exterior, newer AC with Nest thermostat, & many other Smart Home features! New Roof July 2018! Termite Bond and Roof Warranty transfer to new owner. Quick 10 minute drive to the new Florida Hospital in Apopka and Adventist Health System Headquarters. Centrally located just minutes from everything including schools, entertainment, 436, I-4, 414,429 and more! Listing provided courtesy of Benchmark Real Estate Grp Inc.